The autism rights movement (which has also been called autistic self-advocacy movement  and autistic liberation movement ) was started by adult autistic individuals in order to advocate and demand tolerance for what they refer to as neurodiversity. The movement is supported by some neurotypicals including parents of autistic children. The movement is controversial and has been criticized by some parents of autistic children who disagree with its anti-cure and pro-neurodiversity views. The basis of the movement is the view that autism is not a disorder but simply a different way of being. They believe a cure for autism would destroy the original personality of the autistic person in a misguided attempt to replace them with a different (neurotypical) person. Some of the goals of the movement are to challenge the ethics and science of applied behavioral analysis (ABA) and psychiatric hospitals; to include autistic adults in autism organizations and provide services for autistic adults; and to challenge descriptions of autism that they consider to be pitiful, insulting, and/or incorrect. The anti-cure perspective is considered the most fundamental value of the movement. This is a view that autism is not a disorder, but a healthy variation in neurological hard-wiring. The anti-cure perspective supports the model of autism that says that autism is a fundamental part of who the autistic person is and that autism is something that cannot be separated from the person. For this reason, some anti-cure autistics such as Jim Sinclair and Michelle Dawson prefer to be referred to as "autistics" or "autistic people" instead of "people with autism" or "people who have autism", because "person with autism" implies that autism is something that can be removed from the person  (see person-first terminology). Autistics with this perspective oppose the idea of a cure for autism because they see it as destroying the original personality of the autistic individual, forcing them to imitate neurotypical behavior (which is unnatural to an autistic person), simply to make mainstream society feel less threatened by the presence of people who are different. Anti-cure autistics believe quirks and uniqueness of autistic individuals should be tolerated as the differences of any minority group should be tolerated . When people talk about visions for a future where autism has been eradicated, anti-cure autistics usually see this as a wish for the end of their culture and way of being . One autistic person with this perspective is Jim Sinclair, who has written an article titled "Don't Mourn for Us" which has been widely distributed over the Internet. Anti-cure autistics say they wish they had fewer difficulties in life, and that they find some aspects of autism (like sensory issues) painful, but they do not want to have to sacrifice their personalities, values, and basic identities in order to make life easier  . Anti-cure autistics ask that society become more tolerant and accommodating instead of pushing a cure. Anti-cure autistics say they are in favor of helping make the lives of autistic people easier, but they prefer the word "education" over "treatment", and they support programs that respect the individuality of the autistic person and only try to teach them things instead of change them, and they think that autism treatments should focus on giving autistics the means to overcome the limitations posed by autism, rather than curing it. The anti-cure perspective is related to much of the controversy of the movement. Some parents of autistic children see autism as something that gives their children great difficulty in life and therefore see autism as a disorder. Parents with this perspective (which is sometimes called the pro-cure perspective in the autism rights movement) believe that a cure for autism is in their children's best interests   . Logo of the Aspies For Freedom organization, one of the movement's organized groups. Organized groups of the movement include: Autism Network International (ANI), which is a self-advocacy organization founded in 1992 run for and by autistic people and which hosts an annual conference called Autreat; and Aspies For Freedom, an activist group founded by Amy and Gareth Nelson in 2004 which started Autistic Pride Day and protested against the Judge Rotenberg Center. Some smaller regional groups of autistic advocates have also been founded, such as the Asperger Adults of Greater Washington. Amanda Baggs  has written for Autistics.Org, one of the most well known anti-cure autism websites. Jim Sinclair  is a co-founder of Autism Network International and author of the essay "Don't Mourn for Us," a widely distributed anti-cure essay. Judy Singer coined the term neurodiversity. The essays of some individuals in the movement, including Amanda Baggs and Jim Sinclair, have been used as reading assignments in a class at the University of Wisconsin . Some websites play a role in the movement. Although there are a number of personal or vanity websites that express pro-neurodiversity and/or anti-cure views, some websites are more well known than others. The more well known or "prominent" websites include: Autistics.Org, founded in December 1998 and started a number of Internet campaigns; and Neurodiversity.Com is a well known website in the movement and it has replied to some of the movement's critics. Although this movement is sometimes quoted as consisting only of autistic people, there are actually some parents involved in the movement . For example, the website Neurodiversity.com is part of the autistic rights movement and is run by neurotypical parents of an autistic child. Morton Ann Gernsbacher, who is a parent of an autistic child and a professor of psychology, said that autistics need acceptance and not a cure and has expressed opposition to the view of autism as a disorder . Estee Klar-Wolfond, a mother of an autistic son has founded The Autism Acceptance Project in support of autistic people TAAProjectAutistics.Org claims that parents can be the movement's strongest allies  . In addition, some autistic people involved in the movement are also parents . Autism professionals Tony Attwood and Simon Baron-Cohen have sent supportive messages to the Aspies for Freedom organizaton  . It might not be possible to calculate the number of people in the movement, partly because what constitutes autistic advocacy is disputed . However, it is possible to measure the number of people who have participated in specific activist activities. Internet petitions are a common form of activism in the movement, and the number of signatures received by these petitions are usually in the hundreds. The petition to defend the dignity of autistic citizens received 763 signatures . Michelle Dawson's open letter to the Autism Society of Canada received 92 signatures by the time it was sent, October 22, 2003, and another 52 signatures on the web version which were signed after the original letter was sent . The "Our Names are Autism Too" petition received 111 signatures from autistics, and 42 from allies . Supporters of the movement come from around the world. Michelle Dawson is from Canada and Judy Singer is from Australia. Autism Network International hosts its annual conference, Autreat, in the United States. The main event for Autistic Pride Day for 2005 was in Brazil. Shortly after Autism Network International was founded in 1993, the world wide web began to emerge and autistic people started to make websites that expressed their views of autism. As time went on, more and more such websites started. Autistics.Org was founded in 1998 and started Internet campaigns in 2000. The movement has a number of issues and goals that range from challenging the way autistic people are treated by others to challenging the way autism is portrayed. Not all supporters of the movement have the same opinions about the issues and there is controversy about the issues from within the movement. Some people in the movement believe that programs intended to help autistic people actually harm them. In particular, applied behavioral analysis (ABA), mental institutions, and drug therapy have been challenged. In 2004, Michelle Dawson challenged ABA in the Auton v. British Columbia case in the Supreme Court of Canada. Some people have the goal of eliminating autism completely, and want there to be a future with no autism. Since those in the autism rights movement see autism as a natural human variation and not a disorder, they are opposed to attempts to eliminate autism. Laura A. Tisoncik of Autistics.Org has referred to the idea of autism prevention as "genocide" . In particular, there is opposition to prenatal genetic testing of autism in unborn fetuses, which some believe might be possible in the future if autism is genetic (see Heritability of autism). On February 23, 2005 Dr. Joseph Buxbaum of the Autism Genome Project at the Mount Sinai School of Medicine said there might be a prenatal test for autism in 10 years. The genetics of autism have proven to be extremely complex, however, to the relief of some autistic self-advocates. In any case, the Autistic Genocide Clock was started in response to this, which counts down to 10 years after Buxbaum made this announcement . The public has started to debate the ethics involved in the possible elimination of a genotype that has liabilities and advantages, which may be seen as tampering with nature and natural selection in particular. MSNBC has an article titled "Would you have allowed Bill Gates to be born?" which deals with this issue. This puzzle piece ribbon is used by autism organizations. However, some autistics have criticized it. According to those in the autism rights movement, some people have an "insulting view" of autism. This "insulting view", to those in the movement, would be either comparing autism to a national tragedy or fatal disease, and sometimes claims that autism itself is a death sentence (the reality is that autism cannot directly end a person's life, but the lack of fear of physical danger that sometimes results from it occasionally causes autistics to do risky things). Therein, one of the goals of the movement is to expose and challenge those claims they find offensive. One such challenge was in 2003 when Michelle Dawson has protested the statement "autism is worse than cancer in many ways because the person with autism has a normal lifespan" . However, even some "pro-cure" advocates believe some of these statements go too far. Dr. Boyd Haley, chairman of the chemistry department at the University of Kentucky, recently termed autism "mad child disease" in speaking about children whose autism was allegedly caused by mercury poisoning. This term offended some autistics as well as some parents of autistic children. The "petition to defend the dignity of autistic citizens" was started by Neurodiversity.com in protest. In the same vein, autistic rights activists also reject terming the reported increase in the autistic population as an epidemic since the word epidemic implies autism is a disease. Autistic rights activists also take offense to comparing the cost of autistics in society to those without autism. They believe that this gives the impression that autistics are a burden on tax payers and a waste of money. Autistics.Org compared such arguments to those used in support of the the American eugenics movement . Also, some autistic activists believe these campaigns fail to account for what they see as valuable contributions the autistic phenotype has made towards the advancement of the human race. The activists argue that if autism were eradicated, it would cost a great deal more to have to do without the findings and inventions of people who may have been autistic, such as Albert Einstein, William Shockley (co-inventor of the transistor) and Isaac Newton, for example. Some autistic people are offended by the puzzle piece ribbon symbol used by pro-cure organizations, and have responded with their own images and slogans. For example, Autistics.Org has responded to it by selling a button that reads, "I am not a puzzle, I am a person." 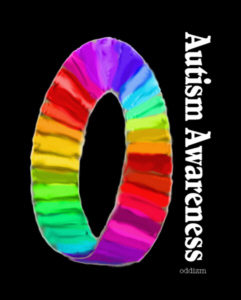 In addition, Oddizms has created a rainbow moebius ring with the statement: "Many autism spectrum adults object to being objectified by the puzzle ribbon ... They want a different symbol and here is my offering" . Some in the autistic rights movement believe the status quo of autism issues focuses too much on children and parents, and tends to exclude autistic adults. They point to various autism organizations like Autism Society of America that have a child as a logo and they feel parents have more power than autistic adults in autism organizations. Michelle Dawson believes that the Autism Society of Canada excludes autistic adults . Autistic people oppose this because they feel autistics, not non-autistic parents, should be the primary focus of autism organizations. They also believe there are more services for autistic children and their parents than for autistic adults, and some advocates of adult inclusion believe that the services and resources that are claimed to be for autistic children are really just for the parents (such as Respite). Autistic rights activists believe many people considered autism experts publish false information about what happens to autistic children when they become adults. They claim that while some autistic adults in the autism rights movement have significant difficulties in life, many of the pessimistic predictions that had been given to them when they were children did not come true. Because of this, autistic rights activists believe pessimistic (from their point of view) things autism experts are saying to the parents of autistic children of today are also false. Autistic adults claim that the definition afforded in an autism diagnosis is designed for children and not for adults, which makes the parameters unworkable and difficult in maintaining/obtaining a proper diagnosis. Because adults are different from how they were as children, they no longer fit the official model of an autistic individual. In addition, autism diagnosis is sometimes taken less seriously when it is made in adulthood rather than childhood, the idea being that if a person were really autistic, it would have been noticed in childhood. Some autistic adults respond to this by citing the relative ignorance about autism on the part of professionals and the general public, even ten years ago, compared to what is known in the present, and that autistic children were often misdiagnosed as learning-disabled, lazy, or as having a thought disorder. Even in the 1980s, professionals specializing in autism contributed to a peer-reviewed journal called the Journal of Autism and Childhood Schizophrenia. A common reason for autistic adults to seek a diagnosis is to obtain services and/or accommodation for difficulties associated with autism. Some, however, only seek a diagnosis for the sake of a personal identity as a confirmation of why they feel "different" in a neurotypical society, or simply curiosity. Sometimes autistic adults find a self-diagnosis to be sufficient for this purpose (even though some prefer to get an "official" diagnosis for a credible confirmation). Those who have diagnosed themselves as autistic would not necessarily be seen as autistic by doctors and may in fact be suffering from Medical Textbook Syndrome (reading about a condition and thinking they have it). Some autistic rights activists believe some characteristics described as being autistic traits are actually misconceptions   and desire to educate the population about what they believe are the real reasons these alleged misconceptions occur. The website Getting the Truth Out is one website that argues that there are misconceptions of autistic traits. The website also opposes the way autism is allegedly perceived by society. As of 2006, many people have begun to subscribe to Simon Baron-Cohen's theory that autistic people lack a "theory of other minds"; that is, autistic people are unaware that other people do not necessarily think or know the same things that they do. However, Baron-Cohen's theory has not been proven to be true of all autistics. Some autistics have suggested that they are only perceived to lack a theory of mind because autistic people do not necessarily communicate with others in the same ways neurotypicals do. This would prevent others' knowing whether autistics have a theory of mind or not. Some autistics who have difficulty with sensory input might be less likely to be able to interpret other people's thoughts and knowledge through observation. Some autistics have observed that non-autistics are insensitive to their perspectives, and write parodies based on this, addressing non-autism as a mental disorder characterized by lack of "theory of other minds";  . It is reported that 75% to 85% of autistic people are mentally retarded. Some people believe autistics are incorrectly diagnosed with mental retardation because of lack of an ability to communicate what they know, and due to fundamental flaws in intelligence testing. According to the original definition by Aaron Rosanoff (as a segment of temperament in his "theory of personality", published circa 1915), it is also a factor that it is quite possible to be strongly autistic, physically normal, and highly intelligent, thus escaping diagnosis as children, and consequently not appearing in current statistics . Gifted children sometimes have autistic traits, which may suggest an association. Although some people believe autistic people have no emotions and no sense of humor (despite the existence of comedians with the condition), some autistic people reject this and report that they do experience a range of emotions, and indeed have a tremendous sense of humour, but just one that a neurotypical cannot relate to just as the autistic cannot relate to the neurotypical's humour - this again comes down to a majority perception of 'the norm', when it appears that there is not one. Autistics with Asperger's Syndrome are in fact typically more emotionally sensitive than a neurotypical yet because of different expressions of emotion, they often come across as rude, abrupt and emotionless, which has done nothing but aid the view that they are emotionless, especially to those who do not wish to 'probe further'. The perception that autistics are emotionless comes largely from the fact that autistics are relatively likely to keep their emotions to themselves, for example not laughing when they find something funny. Autistics also often have different emotional reactions from what neurotypicals expect, and neurotypicals may therefore perceive a general lack of emotion due to an actual lack of some specific reaction that they were expecting. Autistics may also be amused by things that non-autistics would not find funny. Autistic adults such as Jerry Alter and Jessy Park report being greatly amused by concepts "such as eating roads or flowers are growing on a telephone", which are reminiscent of Monty Python-type British absurd humor. The autistic rights movement has contributed to controversies about functioning labels and the distiction between autism and Asperger's in the autism spectrum. In particular, some autistic rights activists are concerned with the functioning labels and the autism/Asperger's distinction making it more difficult to get services for difficulties associated with autism, and they believe the terms are used as an excuse for their opponents to ignore the viewpoints they do not like. Some autistic individuals, in contrast, are supportive of functioning labels and the distinction between autism and Asperger's. Amy Nelson of Aspies For Freedom wrote a proposal on November 16, 2004 that the Autistic community are a social minority group and therefore should be considered as such by the United Nations. This would give certain protection against the forcible use of cures and therapies, either now or in the future. They say that if the fact that people on the autistic spectrum are different in their own right was accepted worldwide, instead of their being regarded as simply a faulty version of "normal" people, it would provide greater freedom to the whole community. Without the stigma or pressure to communicate in the same way as neurotypicals, autistics would be enabled to form social bonds in ways that best suit them. It is sometimes the case that typing or signing is easier than talking for autistics, and there is a large autistic community on the Internet, many of whom are socially isolated locally. The statement from the autistic community on recognition for minority status is at . Some claim that the proposal that the Autistic community be classified as a minority group by the United Nations has divided the autistic community, and even politically. Some autistics believe it is self-defeating to receive special status when they are capable of achieving things for themselves as successfully as neurotypicals. In the early 2000s, activist campaigns started, mostly over the Internet. In 2004, a Autistic Adults Picture Project was started in response to similar projects started by parents that only include pictures of children. In September 2004, the "Our Names are Autism Too" is a campaign that protested an article titled "My Name is Autism" that presented a view autistic activists found insulting. In October 2004, the Signatures of Intolerance campaign was started over controversy surrounding ABA in Canada. In October 2004, Joe Mele conducted the first ever protest against a walk for a cure. This walk was for NAAR. In 2004, the Petition to Defend the Dignity of Autistic Citizens was started to protest the use of insults to describe autism (such as "mad child disease"). After Katherine McCarron, a three year old autistic child, died (allegedy murdered by her mother) on May 13, 2006, some autistic rights activists started online memorials on websites and blogs to mourn her death. In 2006 The Autistic Social Action Committee started a campaign against Rice Krispies support of Autism Speaks. This promotional campaign has since been removed from Kellogg's website. There has been speculation that well-known contemporary and historical people may have been autistic in some form  and the autism rights movement has participated in this speculation. Those who are most commonly discussed are Albert Einstein, William Henry Gates, Isaac Newton, and Thomas Jefferson. In addition, there are rumors that Steven Spielberg is diagnosed. Although this is brought up in the autistic rights movement, it is controversial outside the autistic rights movement as well. Some people considered autism professionals and/or psychologists (such as Simon Baron-Cohen and Christopher Gillberg) have contributed to this speculation. This latter has not been helpful, as they tend to present it as if Newton, Einstein etc. succeeded despite their "terrible affliction" and tend to use AS, instead of autistic (or HFA, which is a better fit for Einstein, given his late speech) while yet other professionals are trying to ridicule any association of science with autism (though Asperger's observation on the subject is clearly well founded) both on the web and in magazines such as Scientific American. In contrast, the copious biographical evidence on Einstein, in particular, shows him to be a slam dunk for both a DSM diagnosis, and the personality type described by Aaron Rosanoff in his paper of 1921: [ A THEORY OF PERSONALITY BASED MAINLY ON PSYCHIATRIC EXPERIENCE -- ROSANOFF 77 (3): 417 -- American Journal of Insanity ]. Study of this latter shows that the autism concept (which Kanner et al only borrowed as a descriptive label) applies not only to those with evident difficulties, but also just about everyone, from Archimedes onwards, who produced any significant invention, or advance in science, logic, philosophy, or any pursuit which requires the unusual (sic) levels of honesty, objectivity, rational analysis, creativity, the desire to understand how things (not people) work...the very features which make autistics so adept at dealing with the laws of physics, yet seem so strange to normals. However NTs may wish to believe that great scientists are people just like them (only smarter?) it stands to reason that normal, orthodox, thinkers do not take the next step to another level of understanding (nor even question the orthodox, nor go against the consensus) so every major development must come from "abnormal" people. To use "autistic" as a stand-alone word for anything other than this original meaning (i.e., autism = a personality type, nothing more, nothing less) only serves to continue the confusion, and support the eugenics program which is behind it! Neurodiversity.com lists eight people speculated as being autistic on its index page and then makes the statement, "honoring the variety of human wiring" . This speculation may simply be an attempt to create role models for autistics and to show people that autistics can do constructive things and contribute to society. This issue is discussed by autistic rights activists often to convince people that it would be a loss to society if autism were cured. Others in the autistic rights movement, however, dislike this argument, because they feel autistics should be able to value their uniqueness without the desire for a cure even regardless of whether or not people like Einstein were not autistic. Some autistics value their "being" regardless of what others think, or of how unique it is. They prefer to redress the current diversion from the original clinical meaning. Pointing out the immense contributions of scientists and inventors who might have been autistic may be an attempt of anti-cure advocates to change the viewpoints of pro-cure advocates. The movement has been criticized, mostly by parents of autistic children who believe the goals of the movement will not help their own children. There are some critics of the movement who still support some of the movement's goals despite opposing other goals. The anonymous website Autism: A Debilitating Disease, Not a Culture argues that the movement's goals of understanding autistic people and changing the world to accommodate them is not enough because understanding will not end self-injury in autistic people and will not teach them to communicate . The website also argues that only the opinions of autism professionals are valid, and not the opinion of autistic activists, because they argue that it is those who are experts in a field who can study a disorder, not those who have the disorder. Some critics of the movement believe Michelle Dawson played an important role in Auton v. British Columbia and is responsible for Canadian children not receiving applied behavioral analysis, which is considered an important therapy by the people who make this criticism. These critics believe ABA has been scientifically proven to be effective and gives autistic children the best chance of success in adulthood. Some critics also fear that the movement will prevent other autistic children from receiving treatment. Kit Weintraub has responded to Michelle Dawson's claims that ABA is harmful by saying that it is harmful to deny medically necessary and appropriate treatment to autistic children who need it. Weintraub said she does not want ideology to triumph over the welfare of autistic children . However, it is widely agreed among the medical profession that whilst some symptoms of autism can be treated with drugs (e.g. aggression), autism itself cannot and should not be treated with drugs. Weintraub also said, "I am afraid of this movement"  and has said she would like to change her son's quirkiness because it prevents him from making friends . She says, "It's no fun being different" . Weintraub has expressed concern about his son's choice to be Mickey Mouse for Halloween instead of characters from Lord of the Rings like the other children. Weintraub has also criticized the movement because of its position on person-first terminology: Weintraub asserts that her children are not autistics they are people with autism. Some critics feel that because a lack of empathy is considered an autistic trait, the autistic traits of the activists of the movement cause them to lack empathy towards parents. Simon Baron-Cohen, for instance, highlights the fact in his book The Essential Difference that there are some jobs, where an excess of empathy would compromise one's capacity to do one's job e.g. armed forces officer [dubious — see talk page]. The autism rights movement has responded to its critics. Autistics.Org says that they receive e-mails from parents of autistic children, saying that the parents claim their own children are different and have more difficulties than them. The people at Autistics.Org argue that when the parents describe their children's difficulties, they are describing the children to have difficulties that range from very similar to their own difficulties that they had as children, to very similar to their current difficulties as adults. Autistics.Org also claims that their claims that they don't want a cure, see autism as a part of who they are, and don't want attempts at help that is actually harmful are wrongly perceived by their critics as not wanting help with anything and living under entirely positive circumstances . Activists in the movement have responded to criticisms that say they are high functioning or Asperger's by saying that some of them have been called low functioning as children by professionals, some of them can write but have no oral speech, and that some of them have periods of time where any form of communication is impossible. They also say it is not true that all autistic advocates are diagnosed with Asperger's syndrome and that some of the most outspoken ones are autistic. When critics claim that the people in the movement are Asperger's and not autistic, the people in the autism rights movement see this as an attempt to diagnose them via the Internet . A. M. Baggs says that when the critics assume that intelligent and articulate autistic people do not have difficulties like self-injurous behavior and difficulty with self-care, they affect the opinions of policy makers and make it more difficult for intelligent and articulate autistic people to get services. Baggs cites examples of autistic people who were denied services because they have IQs above 70 . Some people are also irritated by the perception created by Rain Man that all autistics have savant abilities, although the reality is that the psychiatrist in the film said that Dustin Hoffman's character Raymond Babbitt was very high functioning, unlike many other autistics, who are unable to speak. A countercriticism of this Rain Man defence is that the film was clearly made at a time when understanding of autism was minimal at best, and is not reflective of the reality. Raymond Babbitt is not high-functioning (Albert Einstein met the diagnostic criteria for high-functioning autism). A.M. Baggs who has been published in the Autism Information Library responded to Bobby Newman's argument by saying that she was once in the situation Newman describes and would have wanted activists to stop her from receiving treatment she felt was harmful . Autistics.Org has responded to Kit Weintraub's wish to remove her son's quirkiness so that he will make friends by saying that when someone is bullied or ostracized for a quality, it is because of people who are intolerant and not the fault of people who are different . Some claim that autistic activists cannot claim expertise in autism. Furthermore, some people consider autistic advocates such as Michelle Dawson to be, in fact, experts in autism and some autistic people have degrees in psychology. Some argue that given the perseverative traits of many autistics, it is not far fetched to suppose that some of them have acquired expert-level knowledge in the area. Phil Schwarz has responded to claims that the autistic advocates are higher functioning than autistic children by saying it is not always reasonable to compare the abilities of an autistic child with those of an autistic adult . Some autistic authors such as A.M. Baggs have claimed that this is not always the case that anti-cure autistics have mild difficulties . A common complaint is that anti-cure advocates are clearly able to articulate complex opinions in writing, which is seen by some parents as inconsistent with a diagnosis of autism. It is unclear why such parents rule out the possibility that their children will be able to do the same later in life. Autistics who oppose a cure say they may experience extreme difficulties on a daily basis, and that they oppose being cured despite these difficulties because they believe autism is a fundamental part of who they are. The critics' position is tautological: They claim autistic persons cannot communicate and therefore don't have a voice. If they learn to communicate, they are no longer autistic by definition, and therefore are not allowed to speak on behalf of autistics. The critics' responses consist mostly of ad hominem and straw man attacks , a basic lack of understanding about autism, and anecdotal accounts about scientifically dubious "recoveries". They have not addressed the challenges to behavioral interventions in any meaningful way. The prognosis of autism is notoriously unpredictable. Autistic activists ask why parents should assume that their 3 or 4 year old child will behave the same way at age 30? They have also argued there are no indications that the so-called autism epidemic is anything more than mass hysteria, and that all the "miracle cures" (which are not scientifically validated) are all but mass delusion. Being able to communicate well in writing is not inconsistent with a diagnosis of autism. Autism does not disappear the moment a person learns to communicate. Successfully teaching to communicate is not the same as "curing" autism. Parents should consider that one day their autistic children will grow up and could very well join the autistic rights movement. Parents should take into account the self-esteem of their autistic children. Activists ask, is it better to teach these children that they have a neurological disease requiring intensive behavioral training to correct, or that they have unique and special neurology they should cherish and accept for what it is? Some of the critics' own children have apparently learned to communicate already, so their position is confusing because they argue that the writing abilities of autistic activists is evidence that they are fundamentally higher functioning than the children of the critics. Autistic individuals are usually very sensitive. When their diagnosis (or even a self-diagnosis) is questioned, they usually find that insulting, abusive and cruel. Autism (especially High-functioning) is linked to poverty, depression, and suicide. The debate is ongoing and critics have responded to the autism rights movement's responses to their original criticisms, and the autism rights movement has responded to those. The autism rights movement and it's debates were collaborated online due much in part to usenet's alt.support.autism group. which had autistics and neurotypicals on various sides of rights, cure and treatment issues. Due to the lack of moderation and the abuse of several autistics on that forum by possible cranks, many have taken up blogging in more moderated communities like Yahoo Groups, and several communities on Livejournal, in particular asperger and other blogging and community sites. It should be noted however that the original usenet group has continued to thrive. Much of the current thought has evolved over time by discussions in these communities and groups. Over time, some internet meme has also resulted because of the autism rights movement, much of which is tongue in cheek criticism of the self-diagnosis issue as well as common perceptions about alternative sexual self-identifications. Some of the debate continues offline as well. Autistics and neurotypicals of all ages participating in the autism rights movement may also be expressly excluded from their local autism organizations. Many have, however formed well connected offline chapters to address the lack of this inclusion by some cure oriented autism communities. Some groups however have been making efforts to include such families, groups and individuals in the movement to increase the level of dialogue and create mutual understanding. Some of the most critical pro-cure advocates are non-autistic relatives of autistics, e.g. those represented by FAAAS, Families of Adults Afflicted with Asperger Syndrome. Many such organizations have characterized those in the anti-cure movement as being mostly an adult with Asperger Syndrome phenomenon and object to the anti-cure message as a result of their own personal perspectives of living with autistic adults. Within the movement there can be disagreements. Some autistics would prefer autism to be seen as a disability instead of a disease, meaning that it would have a status similar to blindness or deafness. Autism rights would thus fit within the broader context of disability rights. Analogies to deaf culture have been cited. The concern is that calling for autism to be viewed as simply a way of being or as a non-disabled minority group (much like gay and lesbian persons) would take away from the alleged needs some autistics have for aid and assistance. Joel Smith has criticized the movement because he says that there are some within the movement who only want to include certain subgroups of autistic people in the autistic community and that some in the movement are insulting to neurotypicals . He also says that autistic advocates have enough work to do on themselves before they can begin to think about changing the world . ^ See also the development of this theory by Humm and Wadsworth, resulting in their Aptitude Gradient (or Scale) of 1935, described here: . This was based on Rosanoff's definition of "autism" (etc.) which is also that which Hans Asperger (and, most probably, Leo Kanner?) clearly had in mind (when describing his subjects not as "autistic", but as having autistic pathology), but is now resolutely ignored by clinical experts (most notably by Lorna Wing, who seems to have been unaware of this when describing Asperger's Syndrome). ^ Dawson, Michelle. No Autistics Allowed: Explorations in discrimination against autistics. Retrieved Nov. 8, 2005. ^ includeonly>Harmon, Amy. ""How About Not Curing Us? Some Autistics are Pleading? "", New York Times, December 20, 2004. ^ Schafer, Lenny. Schafer Autism Report. ^ Weintraub, Kit. A Mother's Perspective. Retrieved Nov. 21, 2005. ^ Anonymous. Autism and hyperlexia: One autistic person's perspective. Retrieved Nov. 8, 2005. ^ Anonymous. Autism: A debilitating disease, not a culture Retrieved Nov. 8, 2005. Institute for the Study of the Neurologically Typical A parody of Autism research institutions, sarcastically claiming to be finding a cure for people who aren't autistic. Uncommongenius.org Autistic human rights awareness.